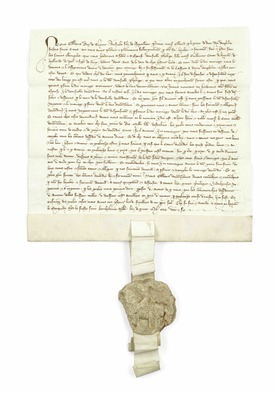 London — The 1326 marriage contract between Edward III and Philippa of Hainault sold for £150,063 at Bonhams Fine Books and Manuscripts Sale in London on Wednesday 27 March. It had been estimated at £100,000-150,000. The contract, written on one skin of vellum, was the decisive factor in a carefully laid plot to invade England, raise a rebellion and depose the reigning monarch, Edward II. Bonhams Head of Books and Manuscripts Matthew Haley said, "This document was of immense significance in the shaping of post-feudal England - as was pointed out in a Times editorial in the run up to the sale. The keen bidding and the price reflected its importance." • A first edition of Harry Potter and the Philosopher's Stone by J. K. Rowling (1965-) that belonged to the writer's first literary agent, Christopher Little. The book, first published in 1997, has sold more than 120 million copies worldwide and has been translated into more than 80 languages. Sold for £68,813 (estimate: £40,000-60,000). • An album of views in Beijing, including Imperial Palaces, and locations in Zhenjiang Province attributed to John Dudgeon. Sold for £31,313 (estimate £3,000-5,000). • The newly discovered handwritten manuscript of part of The Invisible Girl, a semi-autobiographical short story by Mary Shelley (1797-1851). Sold for £27,563 (estimate: £2,000-4,000).